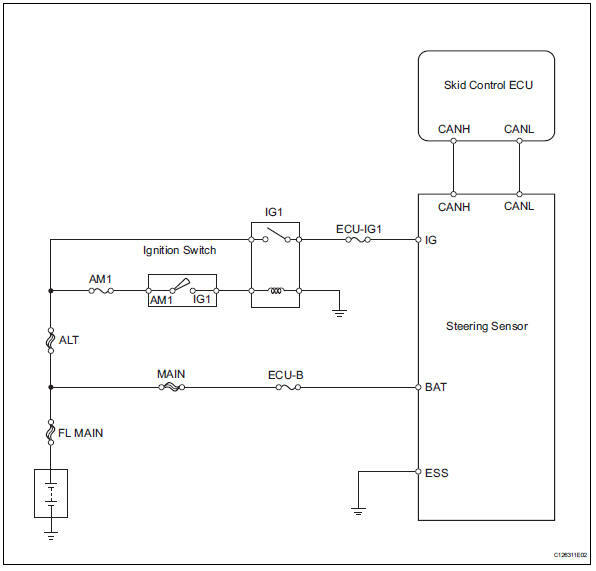 The steering sensor signal is sent to the skid control ecu via the can communication system. When there is a malfunction in the can communication system, it is detected by the steering sensor zero point malfunction diagnostic function. When u0073/94, u0123/62, u0124/95 or u0126/63 is output together with c1231/31, inspect and repair the trouble areas indicated by u0073/94, u0123/62, u0124/95 or u0126/63 first. When there are problems with the speed sensor or the yaw rate sensor, dtcs for the steering sensor may be output even when the steering sensor is normal. When dtcs for the speed sensor or yaw rate sensor are output together with other dtcs for the steering sensor, inspect and repair the speed sensor and yaw rate sensor first, and then inspect and repair the steering sensor. 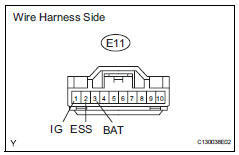 Using the data list of the intelligent tester, check for any momentary interruptions in the wire harness and connectors between the skid control ecu and the steering sensor (see page bc-23). Ok: there are no momentary interruptions. Perform the above inspection before removing the sensor and connector. Turn the ignition switch on again and check that no can communication system dtc is output. Drive the vehicle and turn the steering wheel to the right and left at a speed of 35 km/h (24 mph) and check that no speed and yaw rate sensor dtcs are output. Remove the steering wheel assembly and the column cover. Disconnect the e11 sensor connector. Drive the vehicle and turn the steering wheel to the right and left at a speed of 45 km/h (28 mph) or more for several seconds. Check if the same dtc is recorded (see page bc-47).